(9-week term so fees reduced accordingly). Primarily for children from the age of five. Children have great fun learning musical skills through group activities, playing games and listening. Kodåly and Dalcroze Eurhythmics are taught and the children begin to learn how to play in an ensemble. This session is for primary school children. 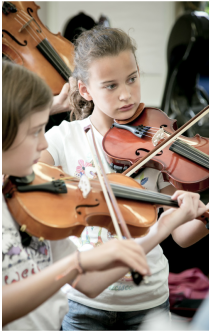 They play in a full string orchestra and continue to develop their skills by using Kodåly and Dalcroze Eurhythmics. ﻿For school-age children of all grades the students are joined by tutors, giving them the opportunity to play alongside experienced musicians. Chamber Orchestra music and students are encouraged to join their County Youth Orchestra.